The clash between Brazil and Belgium will be played at the Kazan Arena in Kazan on July 6th. 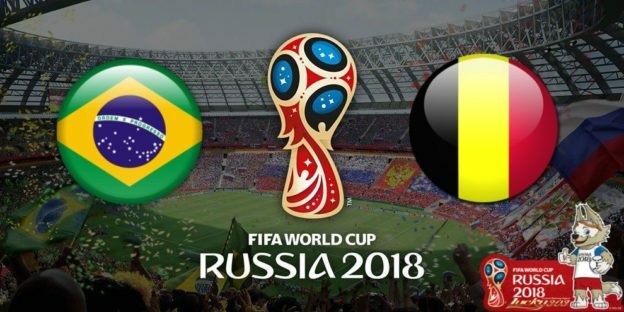 Neither of the rivals suffered a defeat at the World Cup yet; Belgium won all four games, while Brazil drew the opening one but own the next three without conceding a single goal. Following a slow start and a disappointing 1-1 draw with Switzerland, the Brazilians bounced back with a late victory over Costa Rica, while they deservedly beat Serbia in the final game of the group stage to top the group with seven points. Brazil was dominant in the tilt with Mexico in the Round of 16 and they could score more than two goals, but a pair of goals in the Tricolor’s net was just enough to reach the quarter-finals. Willian and Neymar impressed as they played a vital role in both Brazil’s goals, while the substitute Roberto Firmino scored the second, and there is a big discussion about who Tite should start against Belgium, Firmino or Gabriel Jesus. Jesus did nothing to convince us he deserves a place in the starting eleven ahead of Liverpool’s men, so the coach has the decision to make. On the other hand, Roberto Martinez doesn’t have such a problem as his starting striker Romelu Lukaku plays well despite failing to score against Japan in a thriller 3-2 victory. Belgium finished at the top of the group ahead of England with nine points, joining Uruguay as the only teams at the World Cup to collect maximum points in the group stage. However, the Japanese stunned them with a couple of quick goals in the second half of the Round of 16 match, but the Red Devils responded magnificently in the last 20 minutes, scoring a winner in the 94th minute through the substitute Nacer Chadli. Philippe Coutinho had a rather quiet game against Mexico as the Tricolor knew the greatest danger is not coming from Neymar but from the Barcelona man so they doubled or even tripled him on some occasions. However, that left more space for the likes of Neymar and Willian, but this time around, I believe the Belgians will focus on Neymar, which could be a chance for Coutinho to crush them. Romelu Lukaku had a few excellent opportunities to score against Japan, but that was only a bad day at the office for a big fella and he has the quality to pose a real threat to Miranda and Thiago Silva in the Brazilian box, especially from the air. Brazil: Alisson; Fagner, Miranda, Silva, Marcelo (Filipe Luis); Fernandinho, Paulinho; Coutinho, Neymar, Willian; Firmino (Jesus). Belgium: Courtois; Alderweireld, Kompany, Vertonghen; Meunier, De Bruyne, Witsel, Carrasco (Chadli); Hazard, Mertens, Lukaku. Brazil’s chances to win the World Cup are now +275, while the Selecao is +250 to reach the finals. Belgium’s chances to win the World Cup are now +600, while the Red Devils are +333 to reach the finals. Both teams have fantastic individuals and we could have a similar game to the Round of 16 tilt between France and Argentina, and although Brazil and Belgium might not produce seven goals here, I expect to see at least three.